The UConn men’s and women’s basketball teams both won the Division I National Championship this past April, accomplishing this feat for the second time in the school’s history. UConn is the only school to win both championships in the same year and last did it 10 years ago in 2004. Stefanie Dolson was a part of a memorable moment as she had some trouble keeping her balance. President Barack Obama, in mid hand shake with women’s coach Geno Auriemma, noticed Dolson and first made sure she was okay. Then laughs filled the room. This was not the first time Dolson grabbed headlines in the recent future. After the UConn women beat previously undefeated Notre Dame in the National Championship, 79-58, Dolson had some words for President Obama and Tonight Show Host Jimmy Fallon during her post game interview. 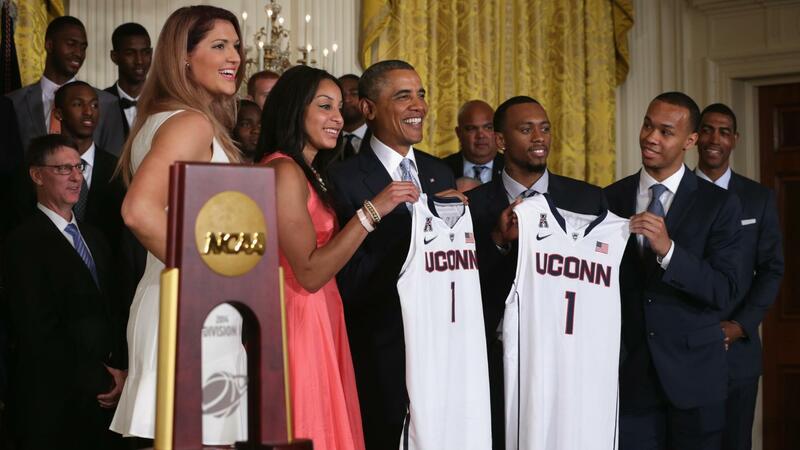 Men’s team stars Ryan Boatright and Shabazz Napier are pictured with the president alongside Dolson and Bria Hartley. Boatright will return to the Huskies for his senior season, while Napier graduated and has entered into the upcoming 2014 NBA Draft where he is projected to be a first round pick. Dolson will be missed on and off the court as she graduated from UConn and was drafted No. 6 overall in the 2014 WNBA Draft by the Washington Mystics. This entry was posted in CT Sports, Home and tagged Barack Obama, Bria Hartley, Dual Champs, Geno Auriemma, Huskies, National Championship, National Champs, President Obama, Ryan Boatright, Shabazz Napier, Stefanie Dolson, UConn, White House visit, women's basketball. Bookmark the permalink. ← Welcome to Zocco’s Modern Life!